Over the weekend we decided to take in a movie and chose Avengers – Age of Ultron. 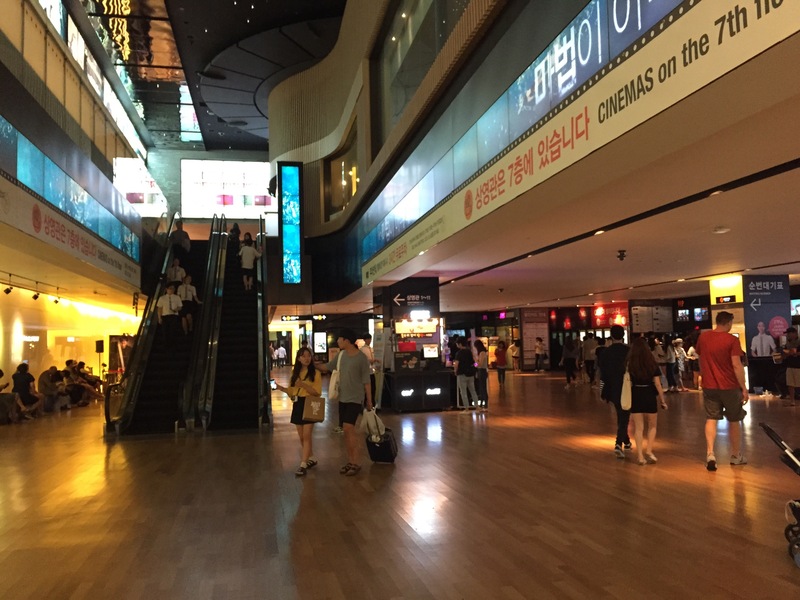 The iPark Mall is the closest location to us and we went to check it out, the mall has a CGV theater on the 6th and 7th floors and there are a total of 11 theaters. So there is an area of the theater where you can purchase tickets via an automated ticket machine, however, if you want to go to the ticket counter you have to take a number and they will call your number when it is your turn. Once our number was called we confirmed the movie would be in English and luckily it was. We were also advised that since we are Olleh mobile subscribers we could get a 10% discount, but we were also advised that military members get a 40% discount. Regular price tickets are 10,000 won, so after our discount it was only 6,000 won (So much cheaper than in the states!). Note that you can’t use the machine if you are using any discounts. When you are purchasing your ticket, they will show you a map of the theater and you get to choose your own seats. This is great, as I hate lining up early for a busy movie and hoping you get good seats. 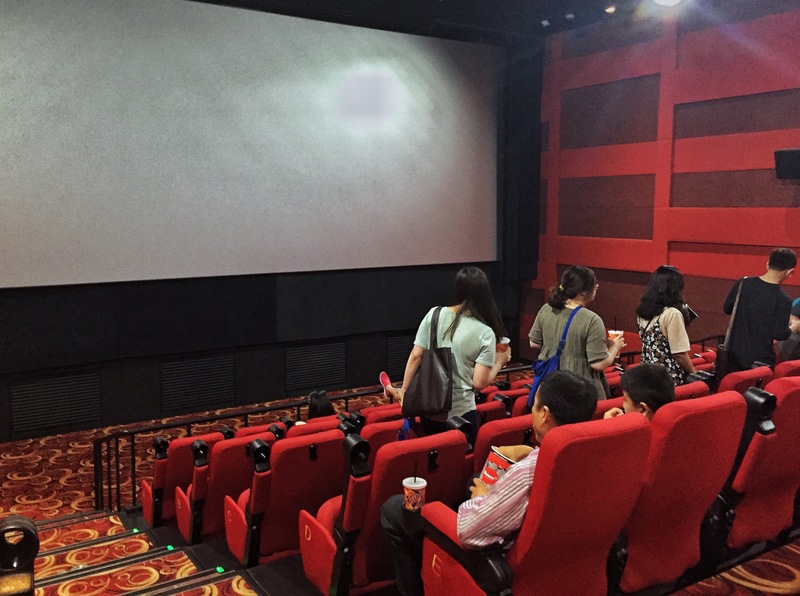 The movie theaters in Hong Kong do this as well, and I love this system! You won’t receive ticket stubs like you are accustomed to, your receipt is your ticket. So in addition to the movie tickets being less expensive, the snacks are less expensive too! 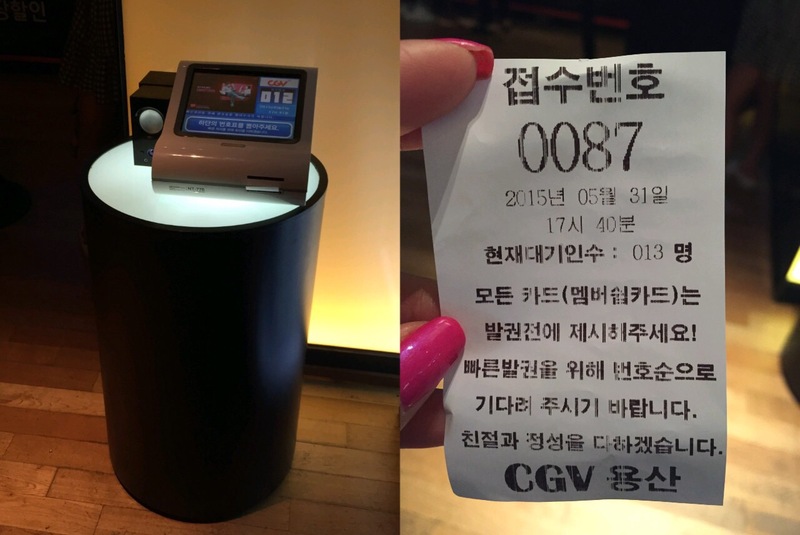 You can get 2 drinks, a popcorn, and nachos for 11,000 won. 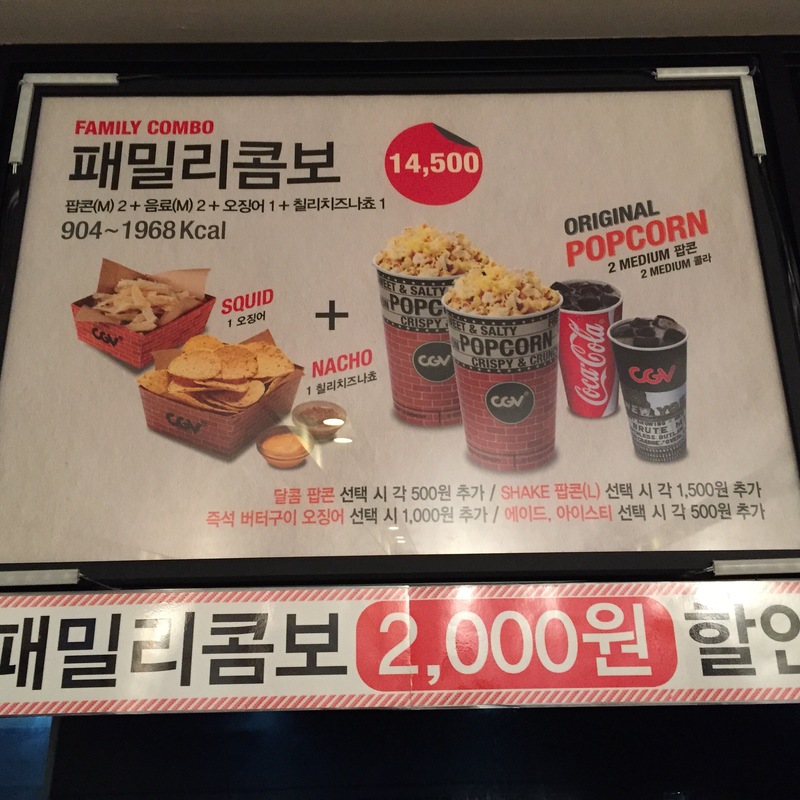 If you’re really hungry you can get a delicious SQUID, nacho, popcorn, and drink combo for an extra 3,500 won. Who knew squid was an appropriate movie theater snack. You can also bring outside food into the theater, so this is a bonus! After you get your ticket and your snacks you won’t be allowed to enter the theater until about 10 minutes before your movie time. That is just time to find your seat and wait for the show to start. The theater itself is pretty much like what you would see in the states, the seats are maybe a little more comfortable, but not a huge difference. You will also notice that each row and seat in the theater is labeled. Next Post Confessions of a Bingsoo (Sulbing) addict….